Now here’s the fun part. Previously, in order to debug and set breakpoints in the annotation processor itself, I used Eclipse RCP and ran it as an Eclipse plugin. Fortunately, there’s now an easier way using Java remote debugging. There are several variations on this technique (configuring an annotation processor directly in IntelliJ or debugging a gradle script). 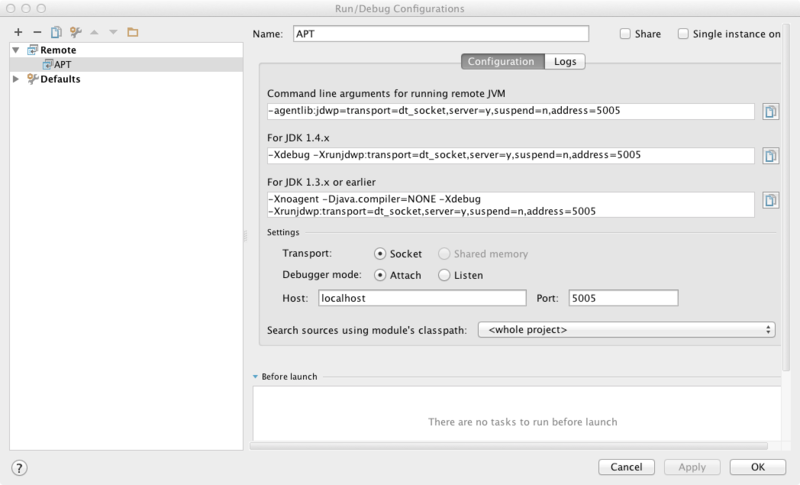 Unfortunately, Android Studio rejected my adding the Xdebug JVM args directly to the gradle script. However, I found this workaround. It is not fully integrated with AS, but does allow me to debug the annotation processor on demand by running the gradle script. Then do something that causes the gradle daemon to start. Now you can go into IntelliJ or Android Studio and attach a remote debugger. I use IntelliJ because AS won’t import the storm-gen maven projects and the whole point of this exercise is to set breakpoints in the storm-gen annotation processor. The screenshot shows configuring a remote debugger in IntelliJ. Just accept the defaults and make sure the port number matches your gradle.properties. It should also work in Eclipse. When the annotation processor runs, your breakpoint in IntelliJ (or Eclipse) should fire. One caution with this technique is that Android Studio will also use the gradle daemon because it’s now configured in your gradle.properties. But if you launched the daemon from the command line, AS will try to launch it again and you’ll see an error message about the port already in use. In that case, simply kill the running gradle process and AS should be happy.